How do the markets rank Green Bay without Aaron Rodgers? Green Bay has been without QB Aaron Rodgers for 3 games, which lets us get a market estimate of his worth. We’ll do this through my market rankings which take closing point spread and adjust for schedule with my ranking algorithm. After week 6, the markets rankings had Green Bay 5th in the NFL, with a rating of 3.9 points. This implies Green Bay would beat the average NFL team by about 4 points on a neutral field. These current NFL market rankings only consider the 3 games for Green Bay since Rodgers got hurt. According to the markets, Green Bay has dropped into the bottom 5 of the NFL. They would now be expected to lose by 5.6 to the average NFL team on a neutral field. While this 9.6 point drop seems too large for me, it does roughly explain the point spread against Baltimore. Giving 2.5 points for home field to Green Bay, these market rankings imply that Baltimore should be about a 3 point road favorite. The markets favor Baltimore by 2. 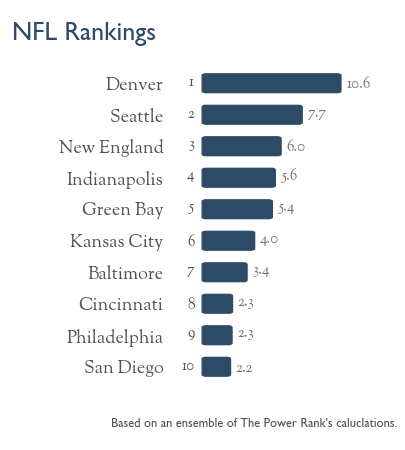 Members of The Power Rank have access to ensemble predictions that include these market rankings. To get a free sample of these predictions for both college football and the NFL, sign up for my free email newsletter. Does Aaron Rodgers draw more pass interference penalties? On my recent appearance on Beating the Book, we were discussing Aaron Rodgers and why he wasn’t playing as well. Host Gill Alexander thew out the idea that Rodgers’ performance might not seem as bad if we included drawn pass interference penalties. I dug into the 2016 play by play data through week 10 to find out. Rodgers has drawn 7 pass interference penalties, just above the team average of 6. Drawing pass interference penalties doesn’t seem like a skill, as Drew Brees has 3 while Blake Bortles and Ryan Fitzpatrick have 12 and 11 respectively. Rodgers does seem to draw pass interference penalties deep down the field. Here are the yardage gains on these penalties: 44, 18, 30, 40, 13, 28, 66. If you include these plays, it would help a pass offense that has averaged 5.8 yards per attempt, 26th in the NFL. Here are the full results for defensive pass interference penalties for all teams during the first 10 weeks of the 2016 season. I’m a little embarrassed Green Bay tops my public NFL rankings after week 4. The Packers haven’t looked good this year. But it shows you the noise in NFL data after only four weeks. These rankings use both my preseason numbers as well as team rankings based on margin of victory adjusted for strength of schedule. Green Bay ranks 3rd in these team rankings, and it’s better than of the four teams ahead of them this preseason. And the Packers might get their act together. However, I don’t think Green Bay is the best team in the NFL. 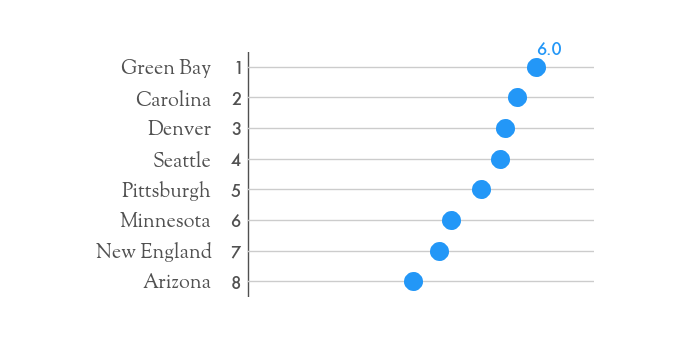 My member rankings use data from other sources and come up with a more reasonable rank of 9th for Green Bay. These public rankings will get better over the coming weeks. Stay tuned. To check out the NFL rankings, click here.